Last year, I wrote The Joy of Our Salvation as a candid recount of the Easter Vigil calling it, “hands down the best liturgical experience I have ever had.” I was amazed by the transcendence in the liturgy, the energy in the congregation, the faith in the catechumens. Last year, everything went exactly as planned. It was an incredible success. This year went a little differently. Now a theology student with a little experience preaching, I was asked by the pastor of St. Camillus Church to give the English “reflection” for Good Friday, the celebration of the Lord’s passion (since it’s not a mass someone other than a priest often gives it.) I was honored. I was excited. Those who know me know that I love big liturgies and I love to preach. Come Friday morning, I felt really great about what I wrote and couldn’t wait to share it with a packed church on such an important day. But things did not go according to plan. Starting around 4:00 that afternoon, I developed a headache which turned out to be a migraine. I was in pain and confused for a few hours. I felt dizzy and disoriented for much of the afternoon. I could see, but part of my vision was blurry. I took a long nap, got some medicine and right before the service started I felt a little better. Rather than have the pastor stand up and have to make something up, I decided to give it my best. I would be in a little pain, I thought, but that I could still do a decent job. In front of my fellow student friars, four priests, and an almost packed church that included friends, strangers, and even one of my professors, I failed miserably. Within twenty seconds I lost my place. After a few sentences, I became downright confused. Looking directly at my written reflection, I could see the words but they meant absolutely nothing to me. I said one sentence a few times because it seemed completely incoherent. Three times I stopped, caught my breath and tried again. I looked at my paper again, but they were only nonsense words. I couldn’t do it. After three tries and about two minutes of embarrassment, I looked at the pastor, said “I’m sorry,” and began to cry as I walked away. I made it to the sacristy, fell to the floor, and cried as hard as I ever had. I hope that this doesn’t come off too dramatic or even privileged, but it was easily one of the top three most painful experiences of my life. 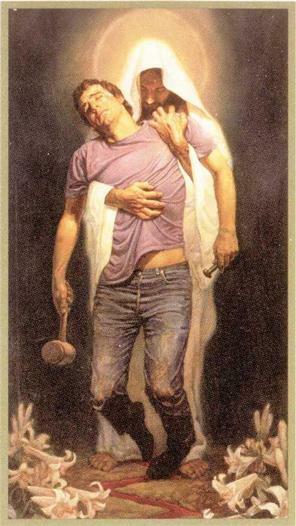 Not only was I in a good bit of pain, I embarrassed the heck out of myself, messed up the liturgy, and back in the sacristy, my classmates, two priests, and some strangers saw me crying, something I have not let people see in many years. How could this night have went any worse? In no way should you feel embarrassed. It was incredibly brave for you to try to do it. I’m very proud of you for trying to tough it out, but also knowing when to ask for help. While I’m sorry you had to go through it, I think for most folks it was a rather poignant demonstration of what carrying the cross looks like in real life. Several people said to tell you what a beautiful homily it was. And it truly was. By most definitions, what I did up there was anything but a success. I stumbled. I lost my place. I didn’t even get 1/3 of the way finished before I quit. And yet, the result was anything but a failure. There before me, I witnessed my brother stepping in to finish my words for me. I felt my classmates and random members of the choir come to bring me water and console me (like ten people crowded in the sacristy within seconds!) Some even mentioned later that the abruptness of the situation broke them out of the predictable pattern and awoke them to something more before them. How could it be that I was unable to do anything right, that the plan failed miserably, and yet Christ’s message came through? God transforms our failures into his success. I stood up, relying on my own strength, thinking that I was going to talk about the pain Jesus went through, the humiliation He experienced, and how He even wept, but my strength was not enough. I couldn’t do it by myself. And I didn’t have to. There we were celebrating the moment in history when Christ triumphantly took our pain and weakness upon himself, subsumed our failures into his perfection, and it began unfolding once again before our eyes. I wanted to talk about this event, but God wanted to show it. My weakness was turned into strength, my failure into success. The Paschal mystery could not be contained by words. To say that this year’s Triduum celebration went off without a hitch would be far from the truth. Before my Easter this year, I had to experience one of the most difficult crosses of my life. Nobody likes to realize that they are not strong enough. Nobody likes to admit that sometimes we fail. But we do. And that’s okay. It is in our weakness that Christ is our strength. It is in our failings that Christ is our success. It is in the crosses we bear that Christ is our Easter joy. May we never be ashamed of our weaknesses, despairing over our failures, or refuse to carry our crosses. Sometimes we fail. Every time Christ succeeds. Happy Easter! Alleluia! Brother, this is a beautiful – and brave – post. Thank you very much. “Bear one another’s burdens and so fulfill the law of Christ.” Happy Easter! I get migraines. It is a red hot poker boring into my skull through have h my eyeball. I have to take a special medication that disolves on my tongue or the smell of the water makes me vomit. I cannot move my head a quarter of an inch or I heave–which send me reeling. The slightest sound or light is pure torture. I am a teacher and I dread the thought of getting a migraine in front of the students. One time I was teaching on the fifth floor of a school and the office was in the basement. The migraine came on suddenly and I called down on our ancient system to say I needed help immediately. The principal, who was not an ardent believe of migraines, dragged his feet up the six flights of stairs. He opened the door just as I grabbed the trashcan and violently through up into it and fainted from the pain, hitting my head and getting a concussion. (He never doubted migraines again.) I was so embarrassed I thought I could never face those 6th graders again. I thought I might need to get another job in a different school. But I prayed and I went back. A dialogue about pain and how to care for someone who is in a medical crisis became the topic of the students and it led to some good parent/student/teacher discussions. God turns all our pain into JOY! But I still hope I never get another migraine. I get migraines too, but mine are caused when I am coming down from a stressful situation, so they always appear on the weekends when I don’t have to work. I know that I could not talk in front of anyone when I have one. You were truly brave and now you know when to back down and ask for help. I really admire you for trying. Look back on it as a learning experience. Your a hero in my book. Thanks so much for sharing this reflection. I can only imagine how hard this experience was and how much it took to see the beauty of the situation and put it into print. It is so beautiful that you were able to give others a chance to preach through their actions of love and support. What lovely community. I teach public speaking. Your experience is the kind that helps my students to know that it will all be OK. Happy Easter to you.